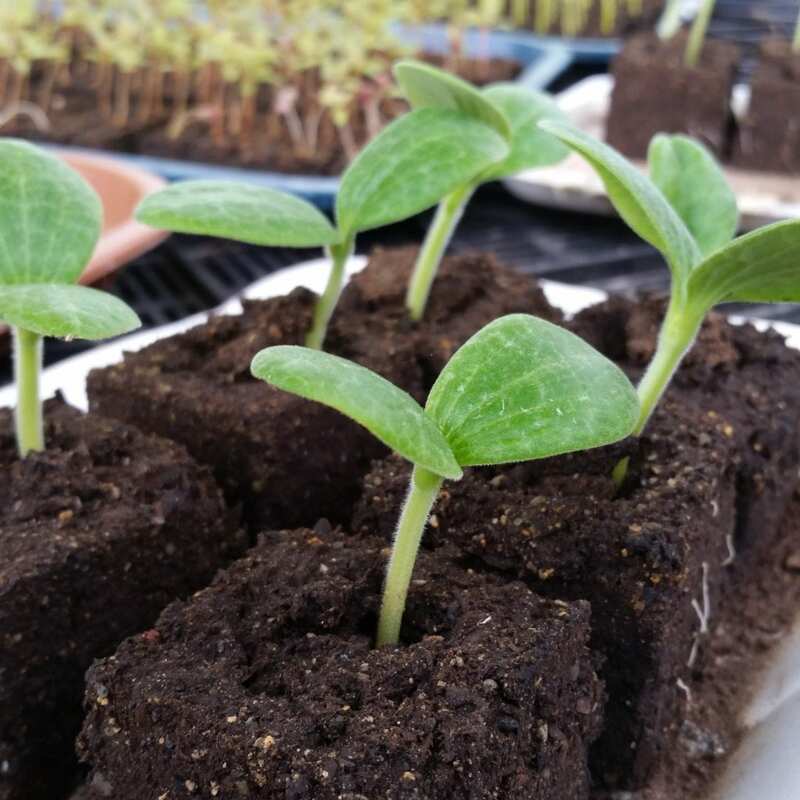 10 day old squash seedlings in 2″ blocks. Aren’t we all looking for a deal? Well, there is no better deal than starting plants from seed. These past years farming have opened my eyes about seed starting and just how easy it can be. Why bother? Put aside all the bucks you can save –it’s the endless choices of seeds to start that is so great. Once you grasp a couple of ground rules you can be on your way to seed starting success. Late winter will bring on a newfound love when the seed catalogs start showing up in your mailbox and knowing you can start them! Rule #1: Learn (internet search engine people) how the specific seed you want to start prefers to begin life: indoors as a transplant or outdoors in the garden. Surprising that folks purchase seeds and attempt to start them the way they feel like starting the seed. This method doesn’t often work out well. Rule #2: Give the seed what they want! Seeds are temperature, light, and moisture sensitive. When they receive warmth, water, and the light or darkness they desire–the miracle happens! A baby plant is born. While all of this may sound complicated, it’s not. As a general guideline annual plant seeds are the easiest to start from seed. In the annual plant family are warm-season tender annuals (tomatoes, sunflowers, zinnias, and others) and cool-season hardy annuals (lettuce, snapdragons, sweet peas, and others.) Annuals tend to sprout quickly which in itself lends a hand to being successful. Cool-season hardy annual seeds are planted in the garden or started indoors in late summer, fall, and very early spring. Warm-season tender annual seeds are planted in the garden or started in spring and throughout summer. Want to learn more about seed starting and how I start seeds? Checkout my online Seed starting course Seed Starting Made Easy ($19.95) and the Frequently Asked Questions on Soil Blocking.